Since 1991,planetary scientists have floated the idea that Mars once harbored vast oceansthat covered roughly one-third of the planet. Two long shore-like lips of rockin the planet?s northern hemisphere were thought to be the best evidence, butexperts argued that they were too ?hilly? to describe the smooth edges ofancient oceans. The viewjust changed dramatically with a surprisingly simple breakthrough. Theonce-flat shorelines were disfigured by a massive toppling over of the planet,scientists announced today. The warping of the Martian rock has hidden clearevidence of theoceans, which in any case have been gone for at least 2 billion years. "Thisreally confirms that there was an ocean on Mars,? said Mark Richards, aplanetary scientist at the University of California at Berkeley and co-authorof the study, which is detailed in the June 14 issue of the journal Nature. Two majorshorelines exist on Mars, each thousands of miles long--one remaining from theolder Arabia Ocean, and another from the younger Deuteronilus Ocean, said study co-author Taylor Perron of UC Berkeley. ?The Arabia would have contained twoto three times the volume of water than in the ice that covers Antarctica,? Perron told SPACE.com. Somewherealong the way to toppling over 50 degrees to the north, Mars probably lost someof itswater, leaving the Deuteronilus Ocean?s shoreline exposed. ?The volume ofwater was too large to simply evaporate into space, so we think there is stillsome subterranean reservoirs on Mars,? Perron said. Theremaining sea would have been located in the same lowland plain as the Arabia Ocean, but almost 40 degrees to the north. As a planetspins, the heaviest things tend to shift towards the equator, where they aremost stable. Earth, too, has abulge at its equator. 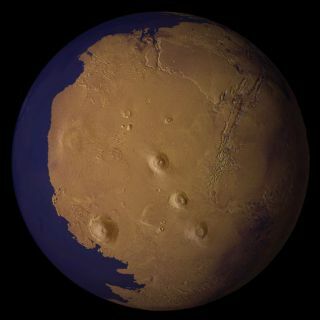 The volcanic Tharsis region of Mars, a vast raisedarea along Mars' equator, is evidence for how this works. ?This isthe reason why this discovery packs extra punch,? Perron said. More than abillion years ago, he explained, something happened in the way mass wasdistributed on Mars to cause the imbalanced portion to shift toward theequator?and allow the vast shores of the Martian oceans to warp. ?We foundevidence of the path the shift would have to have occurred, and it matches withthe deformation of the shorelines,? Perron said. Near theequator, the surface of a planet stays in a relatively flattened bulge underthe pressure of centripetal forces. But outside of the equator, the rockbehaves elastically and often bunches up, like the surface of a deflatingballoon. Perron and his team reasoned that the oceanic shorelines were oncenear the equator, but warped into hilly up-and-down elevationsof rock as they move towards the north with the tilting planet. "Onplanets like Mars and Earth that have an outer shell ? that behaveselastically, the solid surface will deform,? Richards said. Bycalculating the deformation, which occurs in a predictable way, the planetaryresearch team found the ridges had to have once been flat, like oceanshorelines. "Thisis a beautiful result that Taylor [Perron] got," Richards said. "Themere fact that you can explain a good fraction of the information about theshorelines with such a simple model is just amazing. It's something I neverwould have guessed at the outset." Perron andhis colleagues aren?t certain what caused the toppling of the planet, but theythink forces beneath the surface are to blame. ?There could have been a massivechange in the distribution of mantle,? Perron said, ?which would have causedthe planet to shift into its current position. ?